Thyme ground cover comes in a variety of colors, proportions, and pungencies. With a grayish-green tone coloring, its leaves and mint-like flowers range from white to pinkish-purple. There are over 200 species and hybrids of this native Mediterranean plant. 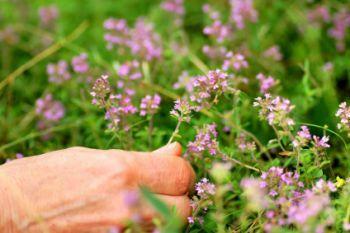 The most popular varieties among them are common thyme and lemon thyme, both grown to be used in cooking. Spruce up rock gardens, front yards, and pond borders with the addition of thyme ground cover. Growing this fragrant hardy evergreen shrub in a mild climate with dry sandy soil and a healthy dose of sunshine will ensure the best results. When developing thyme ground cover from scratch, begin by sowing the seeds at 70 degrees Fahrenheit for germination to take place. After successfully establishing a root system indoors, you may relocate to the fixed and final growth site. Planting the seeds about a quarter of an inch deep in rows dissociated adjacently with roughly two feet of growing space is a good start for beginning seedlings. Once the seedlings are two to three inches tall bring them closer together with only a foot of space between rows. The best time for a garden project like this is in early spring, usually two to three weeks preceding the first frost. If you're dealing with cold circumstances that simply can't be avoided, they can still be overcome with the proper care. Make sure to use well-drained soil for the vegetation to flourish. A natural result of growing in such conditions tends to be larger leaves with less pungency whereas drier, harsher soils enable a smaller, more aromatic plant to flourish. Although it's true that thyme can survive in the freezing conditions, your frost-free days are absolutely the optimal time for gardening. Once the vegetation has been established, maintenance and upkeep are necessary. Irrigation is not required, as this plant grows best in dry conditions. Still, for the plant to thrive, there must be very little if any competition trying to grow with or around it. This is why regular garden pruning and trimming is recommended. Not only does the thyme serve as a lovely garden décor, but if offers a practical defense system against insects. White flies, cabbageworms, aphids, and many other harmful insects are kept at bay due to the powerful repellent-like fragrance thyme emits. One of the most popular and acknowledged uses of thyme is in food. If you require fresh thyme in your recipe, be sure to cut both the leaves and flowers cleanly all at once, in whatever portion that is necessary. The plant will continue to return and grow despite cutting large quantities. The strong, minty-piquant flavor is used to enhance many a fish, poultry, steak, and lamb dinner. Additionally, thyme embellishes the flavor of many salads, soups, stews, butters, stocks, sauces, and dressings. Garden-aesthetics and cooking aren't the only uses that thyme has to offer. There are many health benefits and medicinal applications of this herb as well. Throughout history, people have sought out and incorporated thyme as an herbal remedy. The herb has naturally occurring thymol; a robust oil used as an antiseptic and disinfectant. A conventional herbal fusion for afflictions of the throat, chest, and respiratory system was (and still is today) seeping the leaves in boiling water as a type of tea while inhaling the medicinal vapor that this tea emits. In addition, the anti-fungal and anti-bacterial qualities in thyme made it a good herbal medicine for digestive sicknesses such as nausea, diarrhea, and bad breath. The properties in the herbal tea can reduce excess mucus in the intestinal track and defeat microbes that aren't welcome. It has even been used to treat menstrual cramps. Today we can find the active ingredients in thyme used in over the counter goods such as Listerine Antiseptic Mouthwash, Vicks Vapor Rub, and Amoresse.